The explorer Christopher Columbus made four trips across the Atlantic Ocean from Spain: in 1492, 1493, 1498 and 1502. He was determined to find a direct water route west from Europe to Asia, but he never did. Instead, he accidentally stumbled upon the Americas. Though he did not really “discover” the New World—millions of people already lived there—his journeys marked the beginning of centuries of transatlantic conquest and colonization. Starting in about 1420, small Portuguese ships known as caravels zipped along the African coast, carrying spices, gold, slaves and other goods from Asia and Africa to Europe. Other European nations, particularly Spain, were eager to share in the seemingly limitless riches of the “Far East.” By the end of the 15th century, Spain’s “Reconquista”—the expulsion of Jews and Muslims out of the kingdom after centuries of war—was complete, and the nation turned its attention to exploration and conquest in other areas of the world. 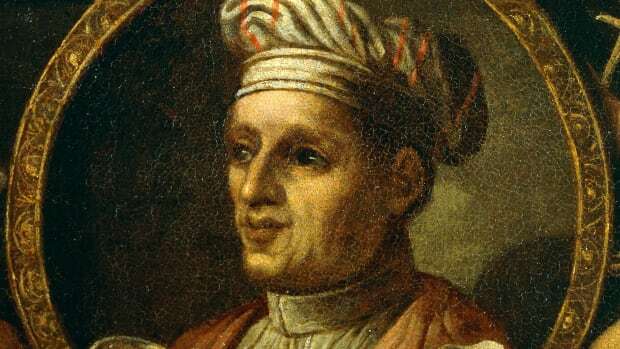 Christopher Columbus, the son of a wool merchant, was born in Genoa, Italy, in about 1451. When he was still a teenager, he got a job on a merchant ship. 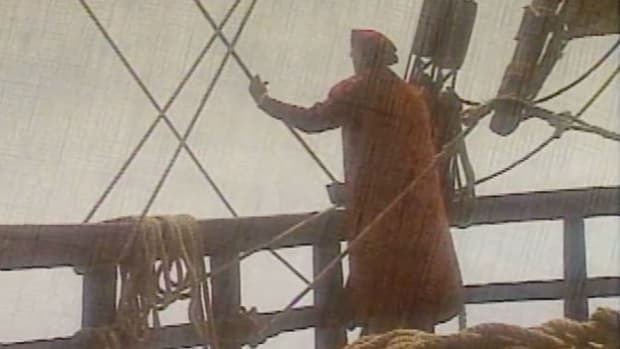 He remained at sea until 1470, when French privateers attacked his ship as it sailed north along the Portuguese coast. 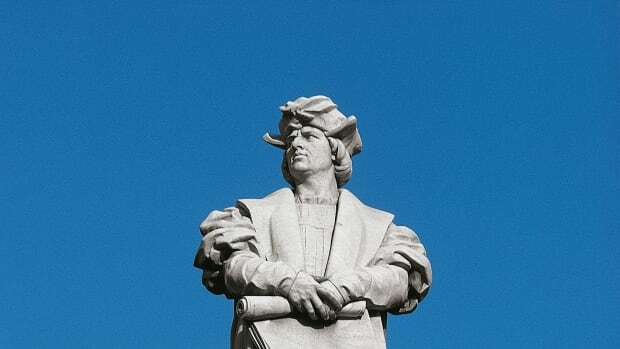 The boat sank, but the young Columbus floated to shore on a scrap of wood and made his way to Lisbon, where he studied mathematics, astronomy, cartography and navigation. He also began to hatch the plan that would change the world forever. But Columbus had a different idea: Why not sail west across the Atlantic instead of around the massive African continent? The young navigator’s logic was sound, but his math was faulty. He argued (incorrectly) that the circumference of the Earth was much smaller than his contemporaries believed it was; accordingly, he believed that the journey by boat from Europe to Asia should be not only possible but comparatively easy. He presented his plan to officials in Portugal and England, but it was not until 1491 that he found a sympathetic audience: the Spanish monarchs Ferdinand of Aragon and Isabella of Castile. Columbus’ contract with the Spanish rulers promised that he could keep 10 percent of whatever riches he found, along with a noble title and the governorship of any lands he should encounter. 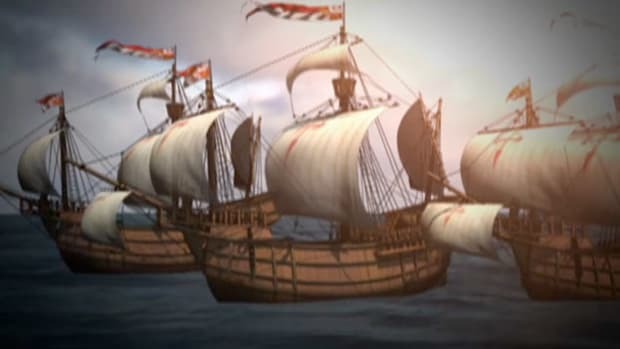 On August 3, 1492, Columbus and his crew set sail from Spain in three ships: the Nina, the Pinta and the Santa Maria. On October 12, the ships made landfall—not in Asia, as Columbus assumed, but on one of the Bahamian islands. 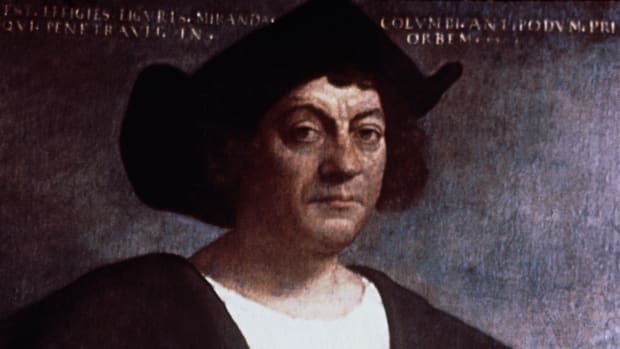 For months, Columbus sailed from island to island in what we now know as the Caribbean, looking for the “pearls, precious stones, gold, silver, spices, and other objects and merchandise whatsoever” that he had promised to his Spanish patrons, but he did not find much. In March 1493, leaving 40 men behind in a makeshift settlement on Hispaniola (present-day Haiti and the Dominican Republic), he returned to Spain. 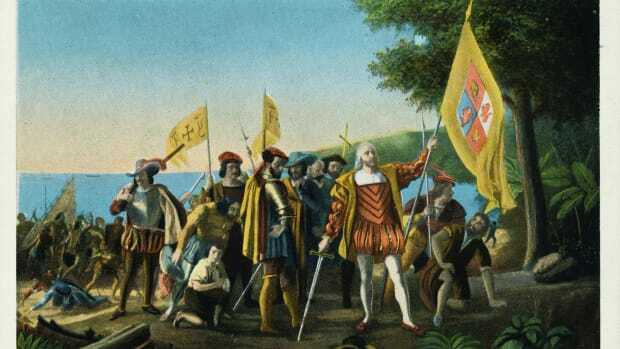 About six months later, in September 1493, Columbus returned to the Americas. 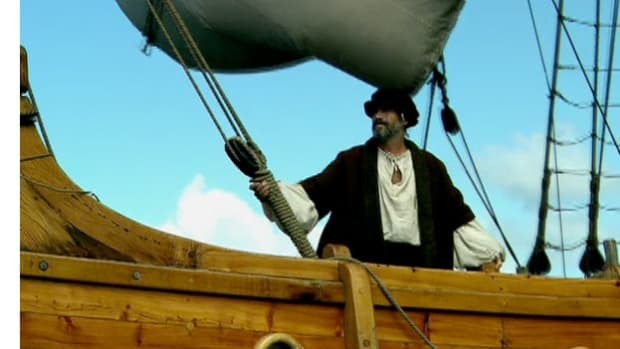 He found the Hispaniola settlement destroyed (to this day, no one knows what happened there) and left his brothers Bartolomeo and Diego behind to rebuild, along with part of his ships’ crew and hundreds of enslaved natives. Then he headed west, with his own complement of native slaves, to continue his mostly fruitless search for gold and other goods. 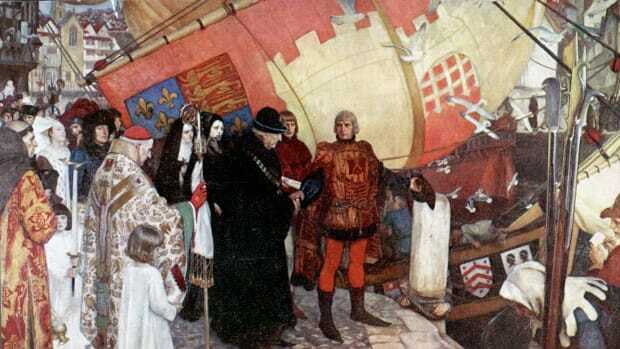 In lieu of the material riches he had promised the Spanish monarchs, he sent some 500 slaves to Queen Isabella. The queen was horrified—she believed that any people Columbus “discovered” were Spanish subjects who could not be enslaved—and she promptly and sternly returned the explorer’s gift. 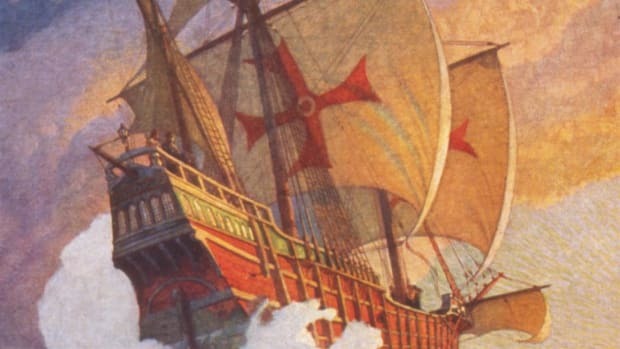 In 1502, cleared of the most serious charges but stripped of his noble titles, the aging Columbus persuaded the Spanish king to pay for one last trip across the Atlantic. This time, Columbus made it all the way to Panama—just miles from the Pacific Ocean—where he had to abandon two of his four ships in the face of an attack from hostile natives. Empty-handed, the elderly explorer returned to Spain, where he died in 1506. However, his journey kicked off centuries of exploration and exploitation on the American continents. 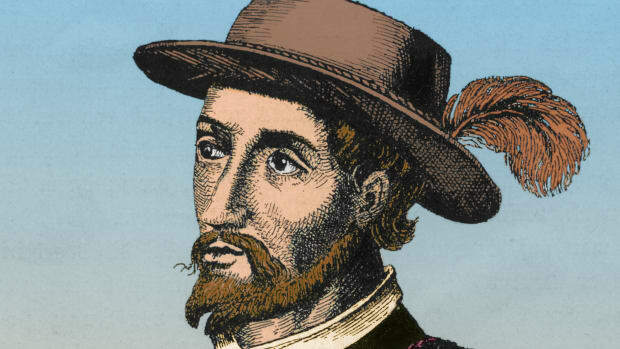 The consequences of his explorations were severe for the native populations of the areas he and the conquistadores conquered. Disease and environmental changes resulted in the destruction of the majority of the native population over time, while Europeans continued to extract natural resources from these territories. 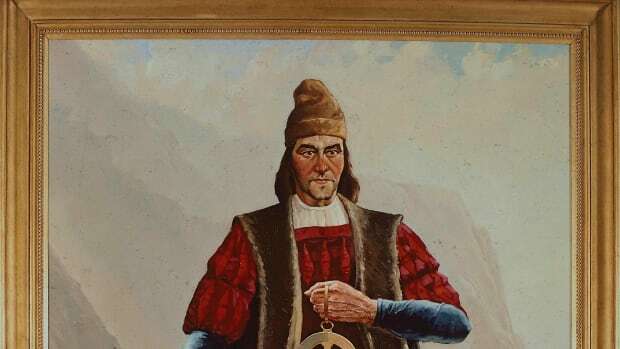 Today, Columbus has a controversial legacy—he is remembered as a daring and path-breaking explorer who transformed the New World, yet his actions also unleashed changes that would eventually devastate the native populations he and his fellow explorers encountered.